The objective of the authors of the Treaty of Versailles with the definition of a League of Nations was to establish an international forum for discussion on the conduct of governments with respect to international law and treaty obligations. The United States Senate never ratified the Treaty of Versailles so U.S. participation in it was informal. The organization of the League of Nations served as a model for a first attempt at a “government of governments”. The flaw was that they didn’t have any enforcement power for their decisions. The collectivists (communists) of the united nations corrected that flaw with agreements negotiated and signed leading to the establishment of the United Nations Association in 1945. 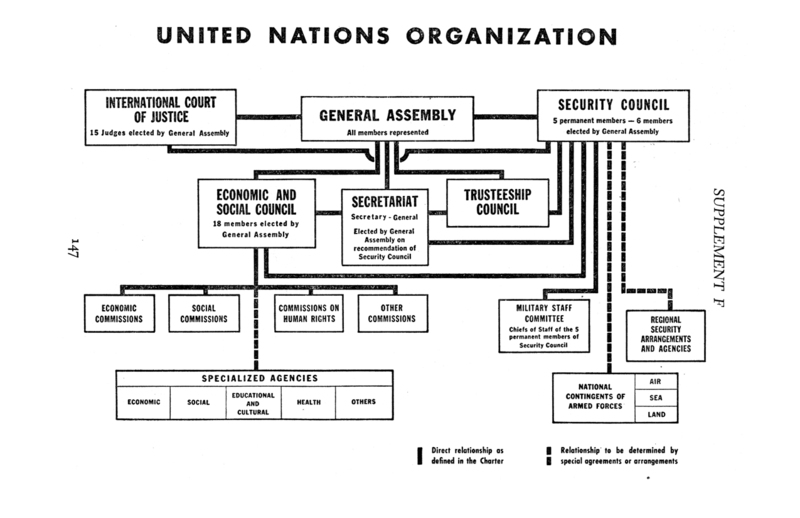 The United Nations website has a timeline of steps leading to the creation of the UN. Click HERE for the link or click on the image of the timeline on the right. The governments of the United States, the Soviet Union, the United Kingdom, and China formalized the Atlantic Charter proposals in January 1942, shortly after the United States entered the war. In the Declaration of the United Nations, these major Allied nations, along with 22 other states, agreed to work together against the Axis powers (Germany, Japan, and Italy), and committed in principle to the establishment of the United Nations after the war. 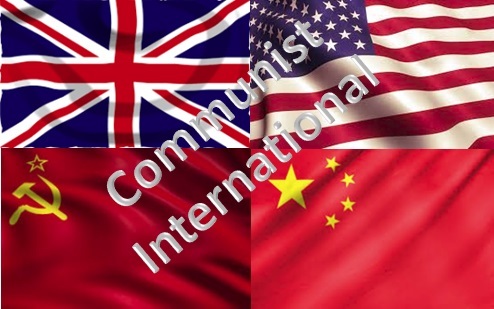 The major Allied Powers–the United States, the Soviet Union, the United Kingdom, and China–reiterated their commitment to forming an international organization in the Moscow Declaration of October 30, 1943, and more concrete international planning for the structure of the new organization commenced. 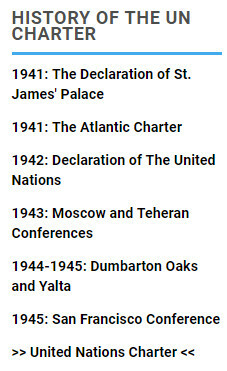 Representatives from these four countries met at Dumbarton Oaks in Washington, DC, from August 21 through October 7, 1944, and the four Allied powers issued a statement of Proposals for the Establishment of a General International Organization, largely based on the draft charter formulated by the State Department’s Subcommittee on International Organization, in consultation with the U.S. Congress. At San Francisco, the delegates reviewed and often rewrote the text agreed to at Dumbarton Oaks. The delegations negotiated a role for regional organizations under the United Nations umbrella and outlined the powers of the office of Secretary General, including the authority to refer conflicts to the Security Council. Conference participants also considered a proposal for compulsory jurisdiction for a World Court, but Stettinius recognized such an outcome could imperil Senate ratification. The delegates then agreed that each state should make its own determination about World Court membership. The conference did approve the creation of an Economic and Social Council and a Trusteeship Council to assist in the process of decolonization, and agreed that these councils would have rotating geographic representation. The United Nations Charter also gave the United Nations broader jurisdiction over issues that were “essentially within” the domestic jurisdiction of states, such as human rights, than the League of Nations had, and broadened its scope on economic and technological issues. The conspiracy and treason against the United States and the American people is revealed by the Vandenberg Resolution, passed by the Senate on June 11, 1948. Participation in regional organization imposed by constitutional process for the purpose of collectivizing American government policy and decision making outside the halls of Congress is subversion of the Republic and a high crime against the people of the United States of America. On December 20, 1945, the Congress voted and passed the United Nations Participation Act. Cornell online law library lists the titles of law for this Act. The United Nations has the Charter posted on their website HERE. It is also posted on the Yale Law School website, Avalon Project. The Yale version of it is easier to read because it is a continuous presentation of the articles. You can read it HERE.